Channel 13 News is reporting a premises injury to a woman at Wyndham Oaks Apartments located at 2410 S. Kirkwood Road in Houston. Apparently a female resident of the apartments fell asleep while studying in her bedroom for a college exam when the ceiling of her apartment suddenly collapsed in on her. The woman was trapped in the rubble. The Channel 13 News article states that residents on Wyndham Oaks says their ceilings and wall have been cracking for the past six months. Mr. Solomon Sampson, identified in the article as the injured woman’s father, said he had complained about the cracks to the apartment’s management, but the requested repairs were not performed. The woman was rescued from the rubble by the Houston Fire Department and was transported to an area hospital to be treated for her injuries. The Wyndham Oaks Apartments web site states that the apartments were built in 1978 and remodeled in 2003, and there are 279 units in the property. The web site also states: “You will find the ultimate resident experience at Wyndham Oaks. This desirable community reflects a tradition of elegant living and creates an atmosphere of serenity enhanced by lush landscaping and dramatic architecture.” Unfortunately the injured woman’s experience appears to have been anything but elegant and serene. Under Texas premises liability law, a property owner may be liable for injuries to a person occurring on the property if the person was injured by an unreasonably dangerous condition that the premises owner either knew about, or should have known about, and neither warned the injured person about the condition nor made it safe. 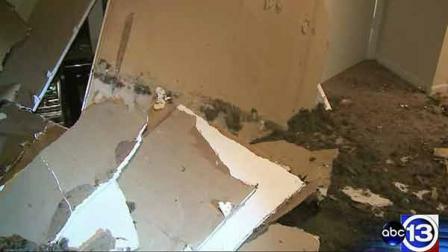 In this particular case it appears Wyndham Oaks Apartments were informed beforehand of the cracked ceiling and walls, however those conditions were not addressed prior to the ceiling collapse. If you have been injured due to the negligence of a property owner, contact Smith & Hassler for a free consultation with our experienced personal injury attorneys. Smith & Hassler recently filed suit in Harris County Civil District Court for a Houston woman who fell and sustained a serious injury resulting in her losing the sight in an eye. She fell at her apartment due to a dangerous condition reported to the property management months before her injury occurred, yet the dangerous condition was never addressed. When people think about a judge they often think of a stern, black-robed figure who does a lot more talking and reprimanding than he does listening (think Judge Chamberlain Haller played by the late Fred Gwynne in My Cousin Vinny). That’s why Harris County jurors find it refreshing to perform their civic duty in the 215th Civil District Court, presided over by Judge Steven Kirkland. During a July 2011 event launching Judge Kirkland’s re-election campaign he described his position as Judge of the 215th as a “job of learning.” What Judge Kirkland was referring to was the Judge’s continuing role as a student of the law who looks to the attorneys in his courtroom to educate him regarding the specific laws in play in a given case. Those who have had little exposure to civil lawsuits may imagine a judge to be all knowing, and think it’s the judge’s job to know the law and tell the lawyers what the law is. Well of course a judge can’t possibly know each and every law and statute in the State of Texas or have instant recall of every appellate opinion or Texas Supreme Court case interpreting the law. The reality is a judge has to rely on the lawyers involved in a case to research the applicable law and then educate the judge on that law. Or put another way, part of a Judge’s job is to listen and learn. Simply put, Steven Kirkland gets that. Judge Kirkland serves the citizens of Harris County efficiently and effectively by expecting the lawyers appearing before him to be prepared, know the law and discuss it with him, all in the interest of keeping the particular case moving along. This keeps the trial docket moving in the 215th District Court, which is good for all. Prior to taking the bench of the 215th District Court in 2008, Judge Kirkland served as a Judge in the Houston Municipal Court system for 8-years and has presided over 800 plus jury trials in his career, a huge number. In Judge Kirkland’s view, anyone called for civil jury service in Harris County (whether they end up serving on a jury or not) should leave the experience having learned something about the civil justice system. If you are called for jury service and find yourself in the 215th, Judge Kirkland will make sure you understand who’s who, what’s going on and why. Judge Steven Kirkland will run for re-election as the incumbent judge of the 215th Civil District Court in November 2012. 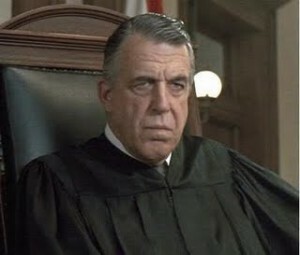 Fortunately for Harris County, Judge Steven Kirkland is more of a listener than Fred Gwynne's Judge Chamberlain Haller! 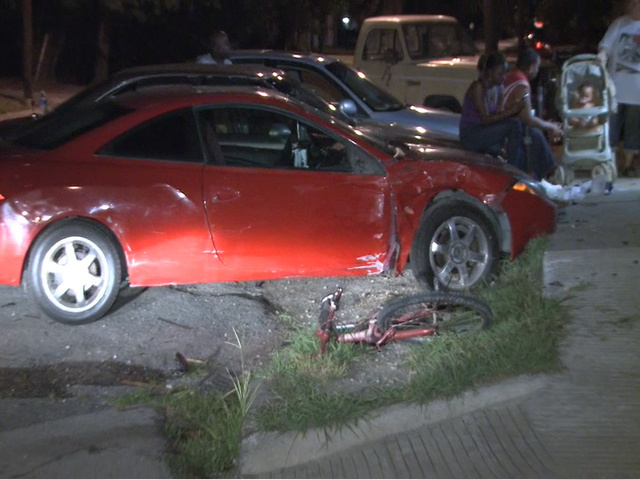 Fox News has issued a brief report on a collision between a silver-colored Dodge Ram pickup truck and a bicyclist near the intersection of Lorraine and Davis in Houston. The accident happened around 1:30am on July 28, 2011. The police account of the accident is that the Dodge Ram pickup hit the cyclist, then struck a red-colored parked car. According to the Fox News report the female driver of the Dodge Ram stated she did not see the cyclist before the collision, however police stated the pickup driver was at fault for the accident. The Federal Motor Carrier Safety Administration continually reminds drivers to share the road with bicyclists, but unfortunately that does not always happen. A bicycle versus motor vehicle accident can yield tragic results. If you, a friend or family member has been involved in a bicycle accident, remember to document injuries such as, scrapes, cuts and bruises by taking good quality, well-lit photographs. Keep any damaged clothing. Secure your damaged bicycle and photograph the damage, particularly any paint transfer from the striking vehicle. DO NOT remove the transferred paint. You can contact the experienced Houston personal injury attorneys at Smith & Hassler for a free consultation: over our 20-year history Smith & Hassler has successfully handled hundreds of bicycle accidents for injured clients. 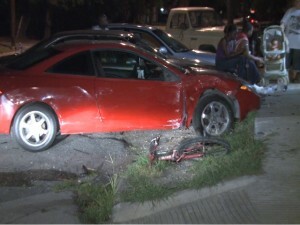 A two-car collision early morning Thursday July 28, 2011 sent two people to the hospital. Channel 11 is reporting that a red-colored Ford Mustang attempted to exit the Gulf Freeway at the 610 Loop South around 1:00am when it collided with a white-colored Chevrolet Suburban SUV. 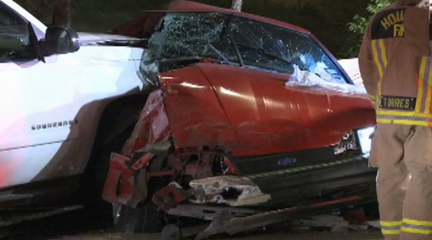 Reportedly drivers of both vehicles were taken to the hospital: the driver of the Mustang sustained a broken pelvis. A car accident is a very disruptive event for most people. A damaged vehicle may mean you cannot get to work, grocery shop, take your kids to school or sporting events, and so on. Injuries may mean you are unable to work, hence unable to support yourself or your family due to lost wages. And not only are you missing income because you are unable to work, but you now have unexpected debts for medical treatment, sometimes in the tens of thousands of dollars. Dealing with all of these challenges at once can feel overwhelming, particularly if you have never been involved in an accident before. If the at-fault driver had insurance, you are probably dealing with requests for information from the insurance company too. Smith & Hassler firmly believes that the earlier in the process you get sound advice from an experienced personal injury attorney who is willing to listen to you, answer your questions and provide you guidance, the better. The insurance company will press you early on to give a recorded statement about the accident, your injuries, your medical history and more: don’t do it, the statement is for their benefit, not yours. You can call or email Smith & Hassler any time for a free consultation on your car accident injury claim. Texas Governor and presidential-candidate-in-contemplation Rick Perry will be in Houston today to meet with Houston-area Republicans for the ceremonial signing into law of HB274, a bill that came to be known as “loser pays.” The stated intention of the law, which was sponsored by state representative Brendan Creighton, is to cut down on junk lawsuits. The law will go into effect September 1st, 2011 and will allow Defendants to push off court costs, deposition costs, expert fees and reasonable attorneys fees onto a Plaintiff. As Smith & Hassler has blogged about previously however, a Plaintiff can take their case to a jury trial, their case can never be deemed “frivolous“, and the jury can still find the Defendant at fault for the Plaintiff’s damages, but if the jury awards less than 80% of a settlement offer made by the Defendant the Plaintiff can be left recovering nothing. Governor Perry declared the loser pays tort reform a legislative emergency thereby pushing it to the top of the legislature’s agenda during the most recent session. Amid all the back-slapping and grinning during the ceremonial bill signing today it will be interesting to hear if any specific examples are given of the frivolous lawsuits HB274 is meant to deter. We can’t remember a single example being given during hearings when HB274 was voted on by the legislature. You would think if frivolous lawsuits in Texas was a significant enough menace that they constituted a legislative emergency, every state representative who voted to pass loser pays could give you several examples. The truth of it is, the loser pays law helps insurance companies and big business interests, and hurts access to the courthouse for legitimate lawsuits filed by Texas families and small businesses. Residents of Alvin, Texas are mourning the loss of a member of their community who will be fondly remembered for her tireless efforts over several decades on behalf of those with developmental disabilities. Betty Ketchum died the morning of Saturday July 23, 2011 when her car was hit by a train. 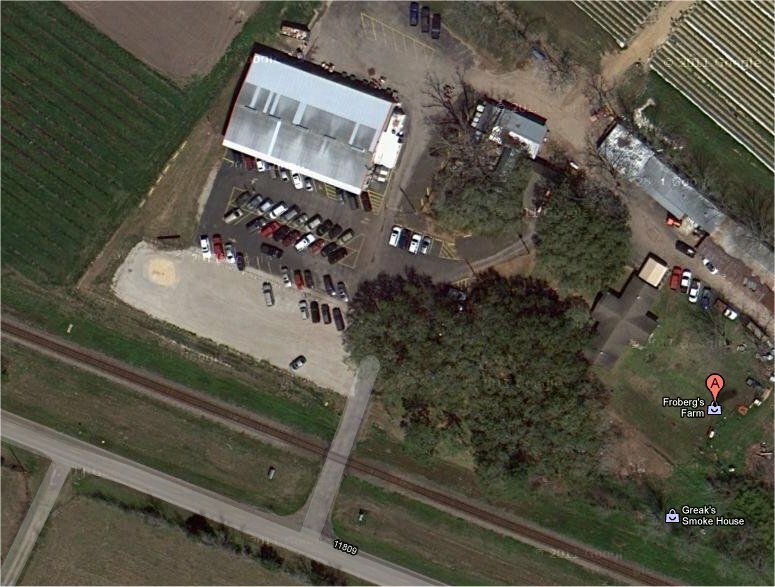 According to a report on Eyewitness News Channel 13’s web site, Ms. Ketchum was crossing the railroad tracks while entering Froberg’s Farm when the train struck her: there is a stop sign at the railroad crossing but no lights and no gate. 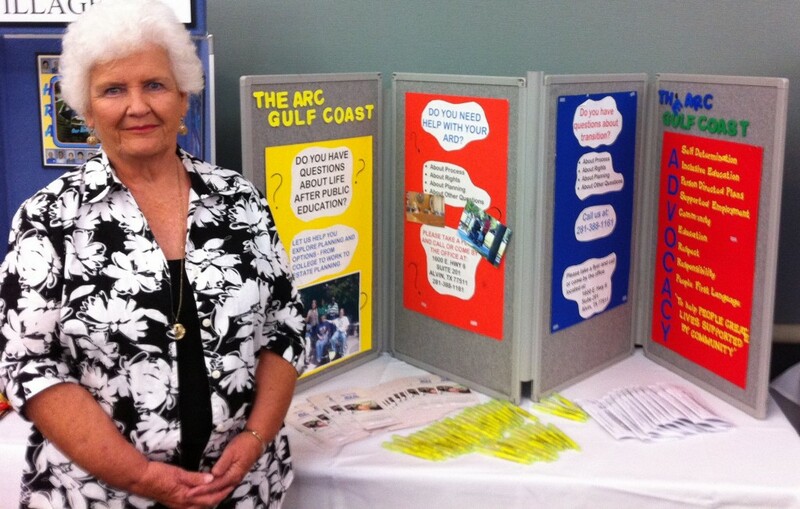 Ms. Ketchum worked as the Executive Director of the ARC of the Gulf Coast, an organization providing services for people with developmental disabilities and their families. Ms. Ketchum began as a volunteer and had been with the organization for 30 years. Click2Houston.com’s coverage of this tragedy can be read online here, and lists the time of the collision as approximately 3:00PM. Apparently BNSF Railroad told Channel 2 that the train was traveling 53MPH when it collided with Ms. Ketchum’s car. Ms. Ketchum is already being remembered for her volunteerism on the web site of the United Way Galveston County Mainland web site where several have shared their memories of her. This is a very sad loss for the whole community. A memorial for Betty Ketchum is scheduled for Thursday at 3pm at the First United Methodist Church in Alvin. This image from Google Maps shows Froberg's Farm in Alvin and a nearby railroad crossing next to CR 190. The Houston Chronicle is reporting that a motorcyclist has died in a hit-and-run incident on Barker Cypress in west Houston around 2:15am Saturday July 23rd, 2011. The motorcyclist was riding a blue-colored Kawasaki Ninja motorcycle and was heading northbound on Barker Cypress. According to witnesses the motorcyclist left his lane and hit a curb, causing him to lose control of the bike and fall into the roadway. Shortly after that a white-colored SUV, also heading northbound, appeared to run over the motorcyclist. The SUV did not stop and the motorcyclist was pronounced dead at the scene. HPD’s vehicular crimes division is investigating the accident. The wreck took place in the westbound lanes of the Northwest Freeway at around 11:30am. Investigators say that a blue colored Scion passenger car and a black colored Dodge Ram pickup truck were involved in a minor accident and had pulled over to exchange information on the shoulder of the freeway. The big rig then approached from behind the stopped vehicle, crashed into the rear of the Scion pushing it into the pickup truck, then pushed both the Scion and the pickup truck more than 100 feet. The 59-year old driver of the blue Scion died at the scene, police have not released his name. The driver of the big rig was arrested for two outstanding warrants. Video footage from KHOU’s web site (see below) shows a busy scene as emergency responders work the accident. The blue Scion appears to have sustained very severe rear end damage and the big rig came to rest at least partly on top of the Scion. 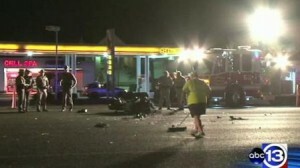 A motorcycle versus SUV accident happened last night in Fort Bend County on Highway 6 near Voss. Investigators say that an SUV was pulling out of a gas station and tried to cross Highway 6 across the motorcycle’s lane of travel, causing the motorcycle to slam into the side of the SUV. The male driver of the motorcycle, identified by DPS as 30-year old Thomas Lollar died at the scene; he was reportedly not wearing a helmet. His 26-year old female passenger Charli Russell survived the wreck and was taken by life flight to Memorial Hermann Hospital in critical condition. We wish her a successful recovery from her injuries. The driver of the SUV was not injured in the crash, but will be issued an at-fault citation, probably for failure to yield the right-of-way exiting a private drive. According to police investigators a young man was driving doubly distracted last night when he got into an accident that claimed his life. The 18-hear old driver was talking on his cell phone and looking out of his driver’s side window speaking with a friend who was driving alongside him. The young man made a last minute maneuver to avoid a car and wound up traveling in oncoming lanes, at which time he collided head-on with a couple in an SUV traveling from the opposite direction. Sadly the 18-year old was killed instantly. The couple in the SUV were taken to hospital to be treated. 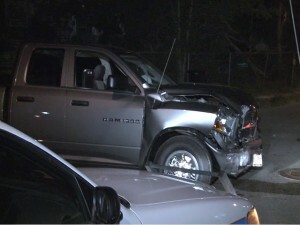 The collision was at Louetta and Haude in North Harris County. Cell phone distraction causes 2,600 deaths and 330,000 injuries in the United States every year, according to the publisher of the quarterly journal Human Factors, the Human Factors and Ergonomics Society. A study by the University of Utah titled “Fatal distraction: A comparison of the cell-phone driver and the drunk driver” found that cell-phone drivers showed MORE impairment than drunk drivers.